Peel pablano's by roasting skin over an open flame or burner until it bubbles and blackens. Do this on both sides. Place in plastic bag for about 30 minutes. When pablano's have steamed and cooled, rinse and remove skins. Pat dry. 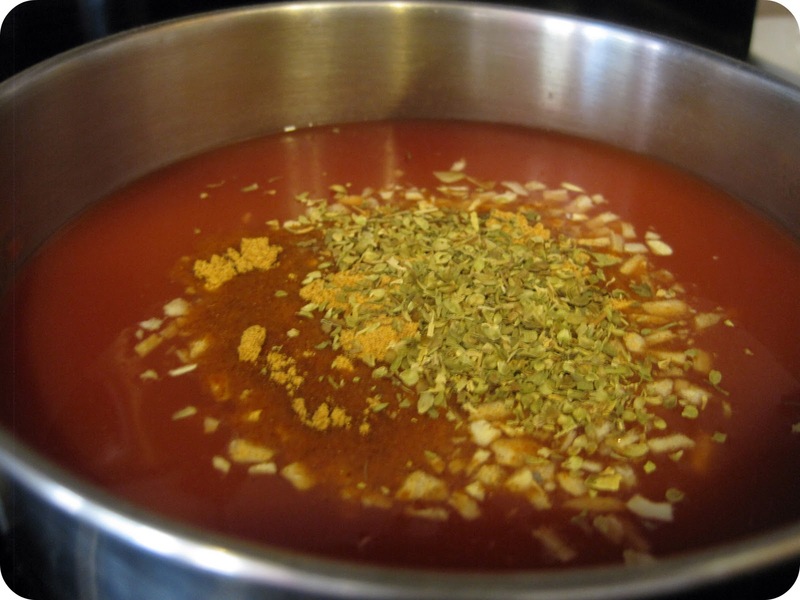 If using canned chile's - drain, rinse and pat dry. Slit poblano's on one side, remove seeds and set aside. Cook ground beef, onion and taco seasoning. Drain and set aside. Cut cheese into 1/2 inch thick strips, making sure they are a little shorter than the poblano's. Stuff poblano's with 1 heaping tablespoon ground beef mixture, 1 strip cheese and bring edges together. Place in fridge for 20 minutes. Separate egg whites from egg yolks and place each in their own bowl. 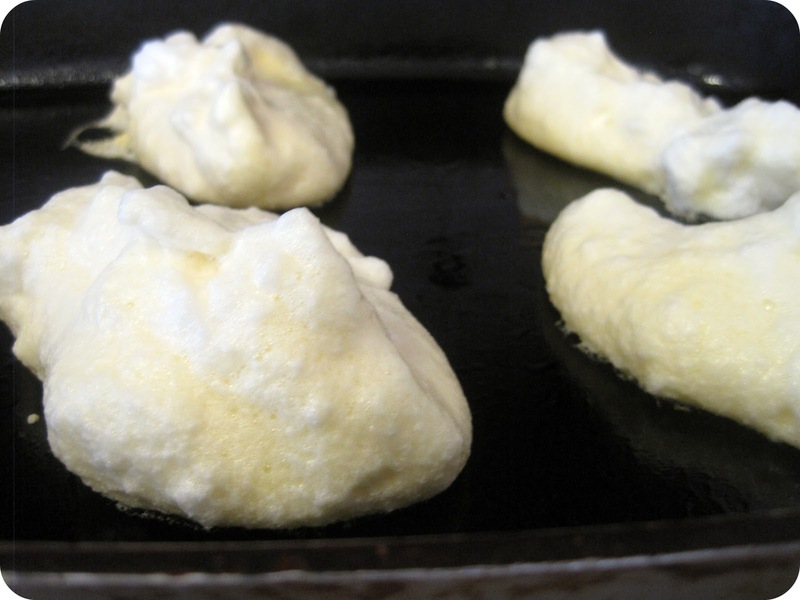 Beat egg whites until they form stiff peaks. Beat egg yolks with salt until combined. 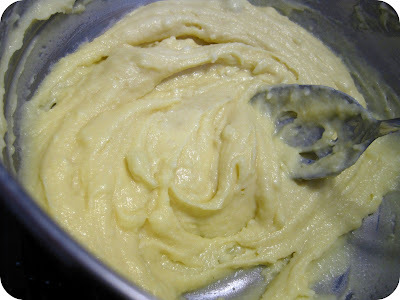 Gently fold yolk mixture into egg whites. Coat griddle with vegetable oil and set to medium heat. 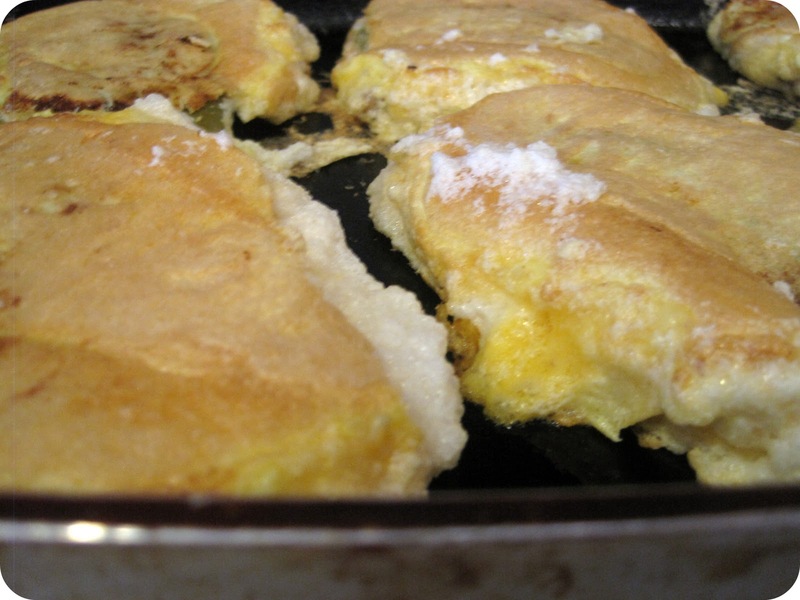 Place 5 large spoonfuls of egg mixture on griddle. Place stuffed poblano's in middle of egg mixture. Place 5 more large spoonfuls of egg mixture on top of each stuffed poblano. Cook until each side is golden brown. 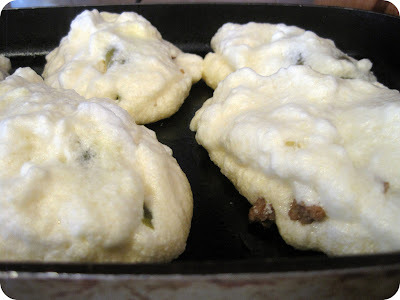 Place into baking pan and set aside. Preheat oven to 350. Combine all sauce ingredients in sauce pan and simmer for 5 minutes. 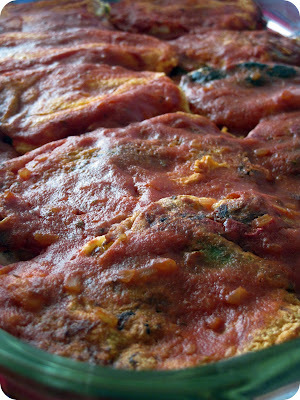 Pour over chile rellenos and bake for 10 minutes. Serve and enjoy! Peel and rinse pablano's. Pat dry. Slit poblano's on one side, remove seeds and set aside. Cook ground beef, onions and taco seasoning. Cut cheese into 1/2 inch thick strips. Tillamook is my favorite brand of cheese. Well, they are my favorite brand of all things dairy! Their dairy is located on the Oregon Coast. Luckily I can still find their cheese here in Georgia. Note: you can also use Oaxaca cheese, a white Mexican cheese that tastes fabulous and melts like mozzarella. 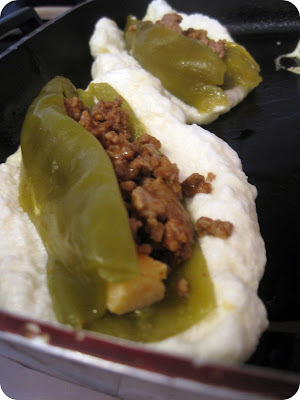 Stuff poblano's with ground beef mixture and cheese. Bring edges together and place in fridge for 20 minutes. Separate egg whites from yolks and place each in their own bowl. Beat egg whites and yolks. Gently fold together. Oil griddle. Place 5 large spoonfuls of egg mixture on griddle. Place stuffed poblano's in middle of egg mixture. Place 5 more large spoonfuls of egg mixture on top of each stuffed poblano. Cook until each side is golden brown. Place into baking pan and set aside. Combine all sauce ingredients in sauce pan and simmer for 5 minutes. 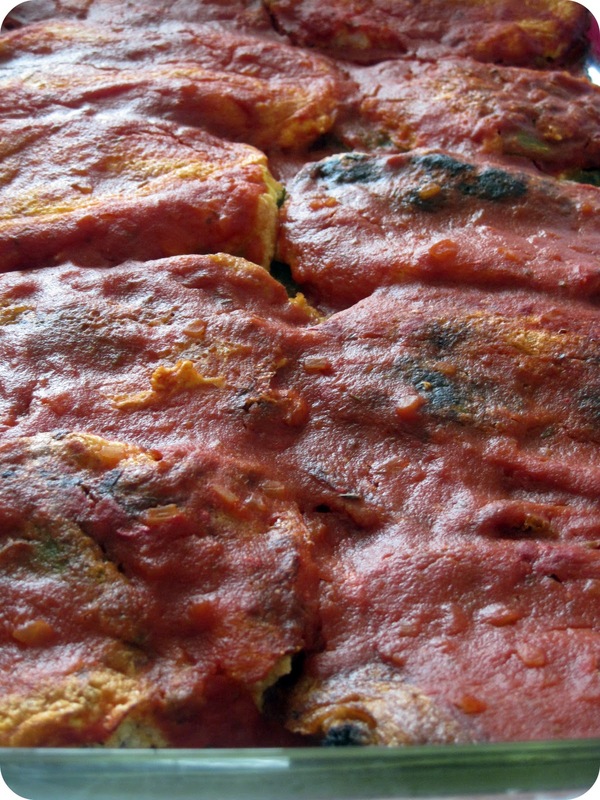 Pour sauce over chile rellenos and bake for 10 minutes. Serve and enjoy! Soooo......I've been obsessed with iced green tea lattes for awhile now. I feel like I'm keeping Starbucks in business with the amount I've been purchasing. I have to admit, I can't get enough of them. I even found some green tea latte candies while I was visiting Savannah. I was thrilled! When we still lived in Portland I decided it was time to start making my own iced green tea lattes at home. I found some Matcha powder (aka green tea latte powder) from our favorite international grocery called Uwajimaya. I couldn't read most of what the package said (hello! ), but after some experimenting, I figured out the right amount of water and milk to create the perfect green tea latte (for me at least!). If you enjoy green tea lattes and can find some Matcha powder.....give this a try. Your pocket book will thank you. Bring 1/4 cup water to a boil. Pour powder into cup. Pour boiling water over powder and let completely dissolve. Stir well. Add 3/4 cup cold milk. Put in fridge or freezer until desired temperature is reached. If you want to drink right away, just add ice. Personally, I like to put in the fridge or freezer because ice dilutes the flavor. Optional: add some fun flavored syrups like mint, peppermint, vanilla or almond. I've been MIA the past few months. We moved to a new house and have been dealing with some personal issues, hence the no posting! Moving is always a huge task. I'm glad to say we are finally settled in and loving our new place. We have our dream kitchen that has granite countertops, a huge island, double ovens and tile floors. We love it! Cooking husband is thrilled with all the counter space and now that I've experienced the joy of a double oven, I'm not sure how I survived with just one. We had a wonderful Thanksgiving with the Paige family. One of the traditions of the Paige family is to make potato pancakes the day after a holiday where mashed potatoes were had! Last Easter I posted our delicious Yukon gold mashed potato recipe. We love them so much that we pretty much make them for any and all holidays. So it's not hard to figure out what happened the day after Thanksgiving at our house. YEP. Potato pancakes! Combine leftover mashed potatoes, eggs and self rising flour until fully incorporated. Drop mixture onto a buttered griddle. Cook on medium high until both sides are brown. Serve with butter, ketchup, ranch, sour cream, etc. Note: If you want to get creative and add more flavor try mixing in bacon bits, cheese, chives, onions, garlic, etc. 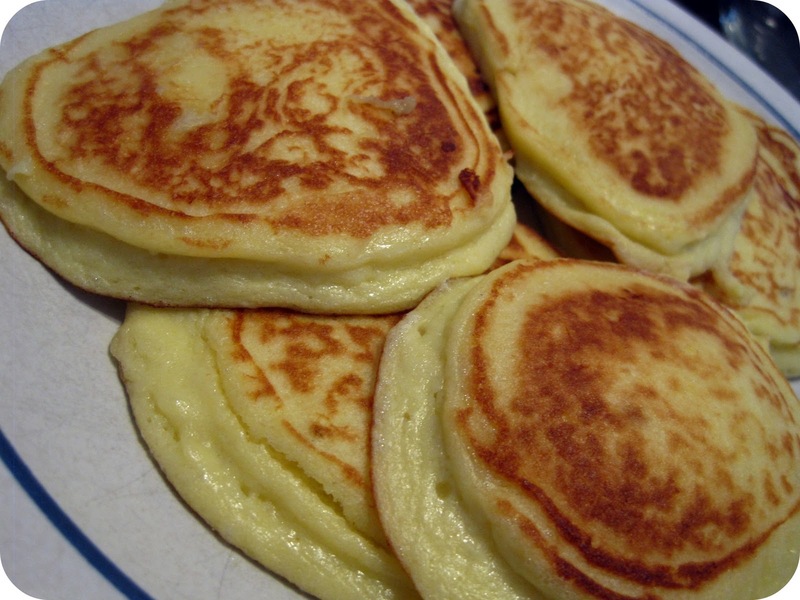 Combine leftover mashed potatoes, eggs and self rising flour. 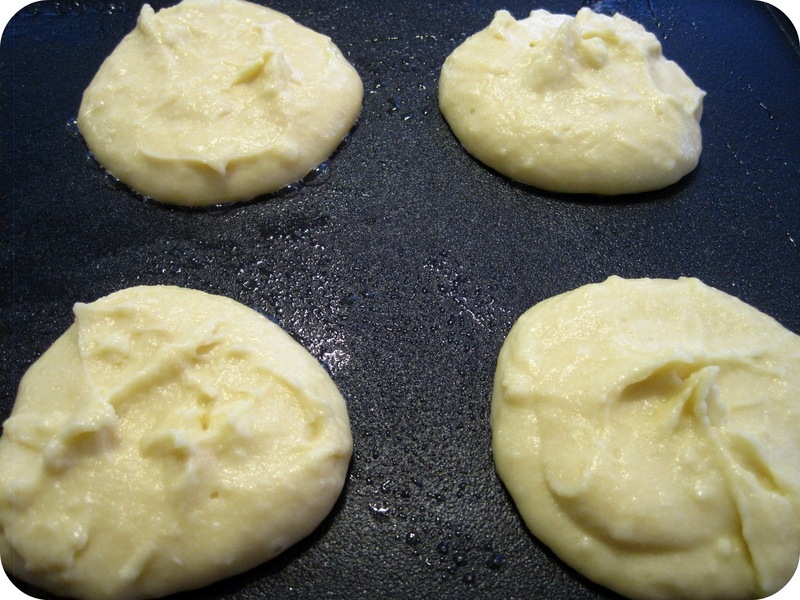 Drop mixture onto a buttered griddle. Cook on medium high until both sides are brown. Gobble these up and enjoy every bite! I love the fall. I love the trees as their leaves change color, I love the cool crisp sunny mornings, I love that thanksgiving is next month and I get to eat loads of mashed potatoes (oh, and of course spending time with family!). Most importantly, I love that fact that I can have my pumpkin spice lattes again. Am I hearing the hallelujah chorus!??!?! Yes. Yes, I am. It could also be that I'm an October baby. In fact, I am celebrating number 35 this very day! 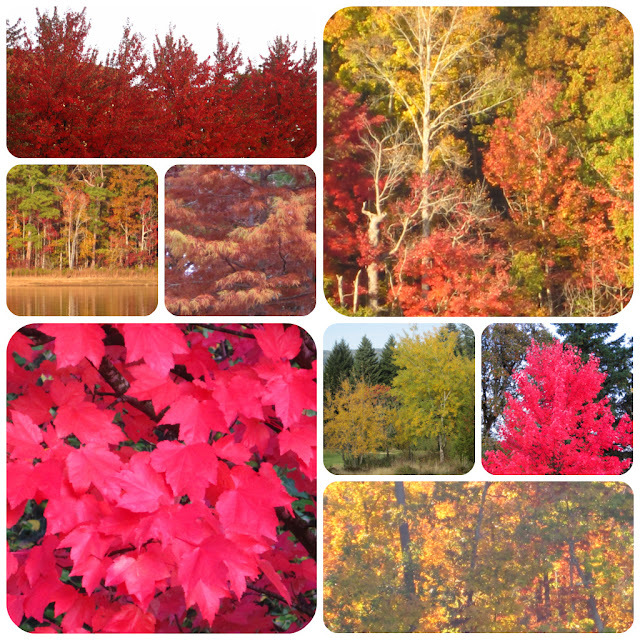 Since I was feeling the fall spirit, I decided to snazz up our blog for the fall season. 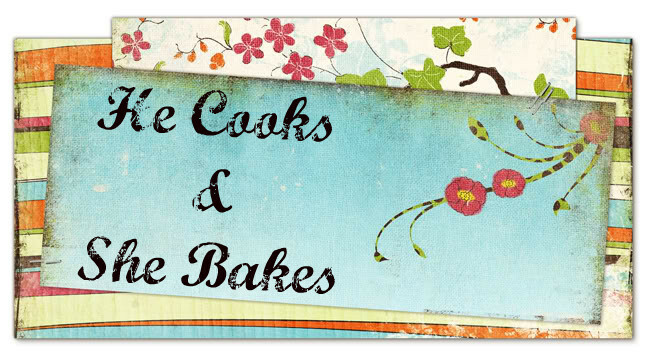 I found a brilliant web site called Shabby Blogs through my friend Melissa. There are some talented and creative folks at Shabby Blogs. I was impressed! 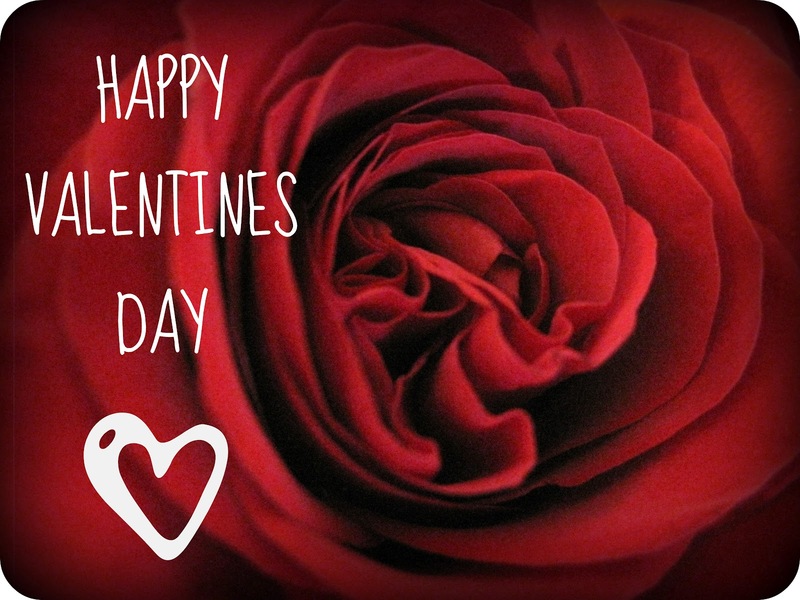 I spent most of last night perusing through all their adorable freebies and changing up our blog. I enjoyed my little makeover project so much that I've decided to change the look of the blog with the change of every season.